One of the more adaptable hose assemblies on the market, a rubber hose can be altered and added to uniquely in order to provide all of your hosing solutions. 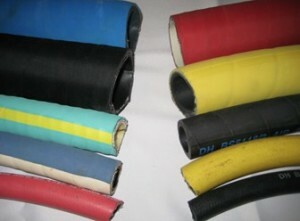 Rubber hoses have a multitude of uses at home, in vehicles and in a variety of industrial applications. Simply put, it is a flexible tube used to move and dispense liquids or gases and are available in a variety of sizes. Being more durable than a standard PVC hose, rubber industrial hoses are also just as adaptable with their inner linings often comprising of more robust materials which does influence the flexibility of your product. One of the great draws of the rubber hose is that, although not as flexible as other hoses, its desirable level of malleability offers competitive levels of protection when compared to the higher end hoses. Additionally, rubber hoses require couplings or other attachments that are usually made of metal or plastic to connect to machines, devices or other hoses. Look to a wire helix if you’re after heavy duty usage in a suction capacity or adopt a thicker shielding for the best from your hose. This hose type is an essential in many industries and keeps our vehicles, homes, hospitals and many other places running smoothly. One of the most popular types of rubber hose is the fire hose, which is typically lined with natural rubber. Industries which can often depend on rubber hoses are the chemical industry, food & beverage, petroleum and mining. As for everyday use, this hose type is an important part of the cooling system of cars and other vehicles.